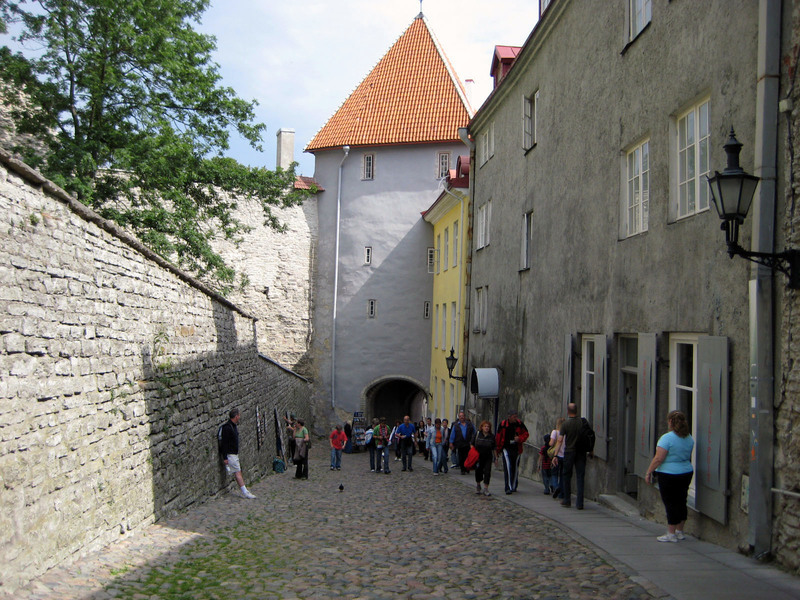 Tallinn, a small city of around 500,000, is the capital city of Estonia. There is a lot of old history here and it’s one of the best preserved old towns in NorthEastern Europe but most people come here because this is a fun loving, beer guzzling, city of of partying people. The sun goes down around 11pm this time of year (July) and that’s when the party just gets started. Festivals and holidays these days are measured by how much beer is consumed. We saw a advertisement for the Tallinn Summer Festival with the tag line, “the biggest beer fest of the year”. Between 500-1000AD beer was used as a sacrificial drink. It’s still religiously consumed. The local favorite is Saku Beer, which, by the way, has American actor David Duchovny shilling for them. The other Estonian label from Tartu, a nearby city is A. Le Coq, whose motto is “Asi on maitses”, “it’s about the taste”. For non drinkers (all 10 of them), there’s a Non alcoholic beer called Kali that the Estonians refer to as Estonia coca cola. There is also Kvass (made from fermented black bread), a drink very popular in Russia; Estonia was once part of the Soviet Union. It’s considered to be non alcoholic, even though it does actually contain 1.5% alcohol. Some might think a beer guzzling population could never amount to anything except lazy, fat, complacent people. Not true. Beer consumption in Estonia has fueled some of the most unique achievements known to mankind. Estonians have dominated the World Wife Carrying Championships by using the ‘trademarked “Estonian Carry”, the wife is suspended upside down from the husband’s back with her legs wrapped around his neck. In some places, the winning prize is the wife’s weight in Beer. In 1996 Mait Lepil became Estonia’s 1st banana eating champion by eating 10 bananas in three minutes. 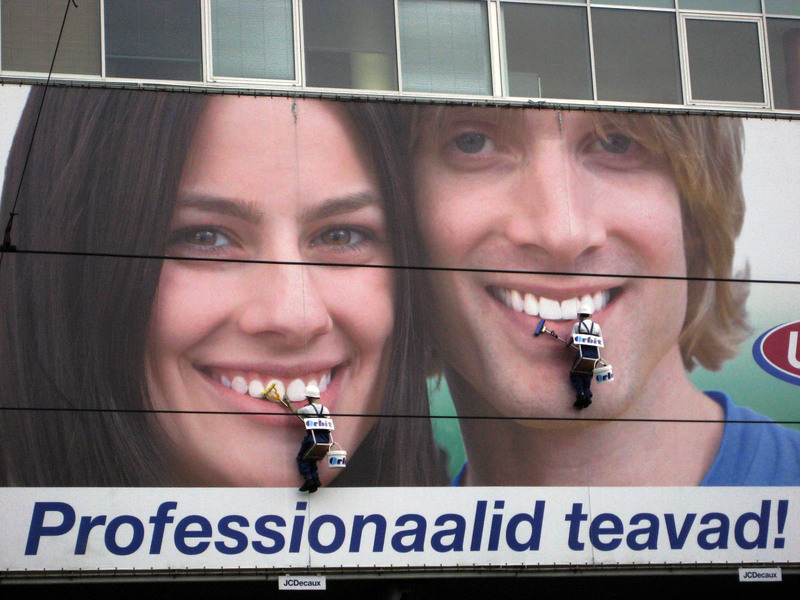 In order to save time he didn’t peel them. He won a free trip to the Canary Islands, but he would have been happier if the prize was beer. And in 1988, what started out as a friendly “beer drinking” sing-along turned into the even larger beer drinking “Singing Revolution”. Yes, Estonians won their independence from the Soviet Union by singing rock versions of national songs. In four years, over 3 million people (and probably a few million beers) sang themselves to freedom until 1991, when the Soviets finally gave up and left. A stunning tribute to the power of Rock and Roll. 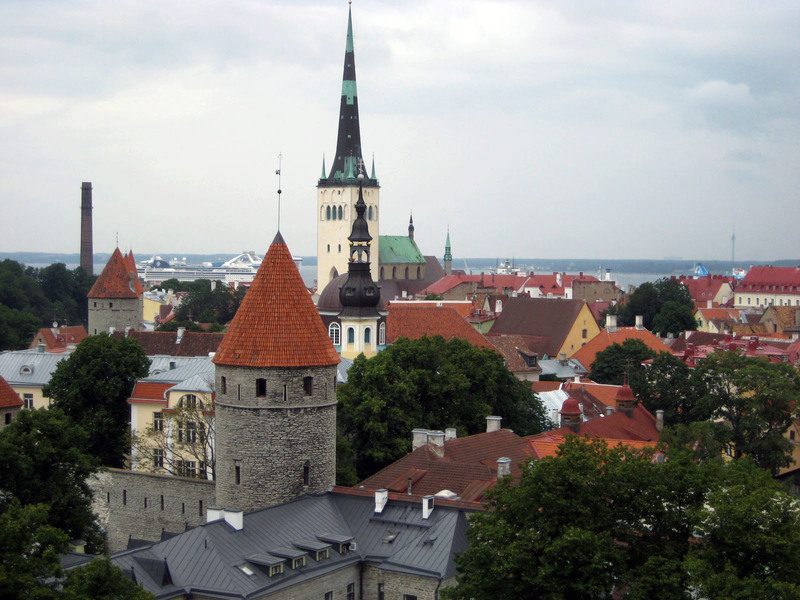 Since the Independence, Tallinn has become the favorite pub city for Finlanders who can’t afford to drink in their own country. It’s less than an hour away from Helsinki by ferry boat. It’s also the Party Mecca Brits who are always looking for a cheap pint or two and quiet street to piss or vomit. The bars here have names like McCools, Hell’s Hound, Scotland Yard, Harley Davidson’s, Molly Malone’s and Bonnie and Clyde. There’s also the “Beer Hall”, loosely modeled after a German Beer Hall only with louder music. And that’s just in old town. New town is filled with casinos, strip clubs and larger, more outrageous bars. One of the British Travel companies specializing in Stag Parties in Tallinn is called “Piss Up Travel”. Now, I’m not saying the old town is just one big “Piss up”. During the days, the partygoers are no-where in sight; they probably don’t get up till late afternoon. Even though the city has been pillaged, sacked and bombed quite a few times, it’s still one of the best preserved old towns in Northern Europe. Most of it was built in the 17th-19th centuries but the walls and towers go back as far as the 11th century. It looks like a movie set and most likely it’s been used as one at least a few times. Our hotel, The Three Sisters, combined three 15th century merchant houses into one really beautiful hotel. Our 2nd story window faced the street, and air conditioning is only in the 3rd floor, but for the most part, the nights were cool and quiet until the beer drinker come by around 3am. But they usually don’t stay long. There are no bars in this part of the old town. The Three Sisters has just opened up a new and really beautiful place called the Telegraaf Hotel. Although our hotel is really nice and very historic, the Telegraf Hotel is contemporary, comfortable, an a clever nod to the old telegraph and post offices that once inhabited the building. The carpet is design with old postal stamps, the bathroom wall paper is designed with old postcards. And it’s a 2 minute walk from the Town Hall Square. The Three Sisters is very close to the 15th century St Olav’s church. Between 1549 and 1625, it’s 525 ft high Gothic spire was the tallest recorded building in the world. But after the fires of the early 17th century (yes wooden buildings always catch fire) it was rebuilt to its current height of 406 ft.
St Olaf’s was also the site of the first recorded Christmas tree when on Christmas eve in 1441 a group of young drunk merchants decorated a tree, danced around it with some local babes and then for the grand finale lit it on fire. Beer drinking is an old tradition here. 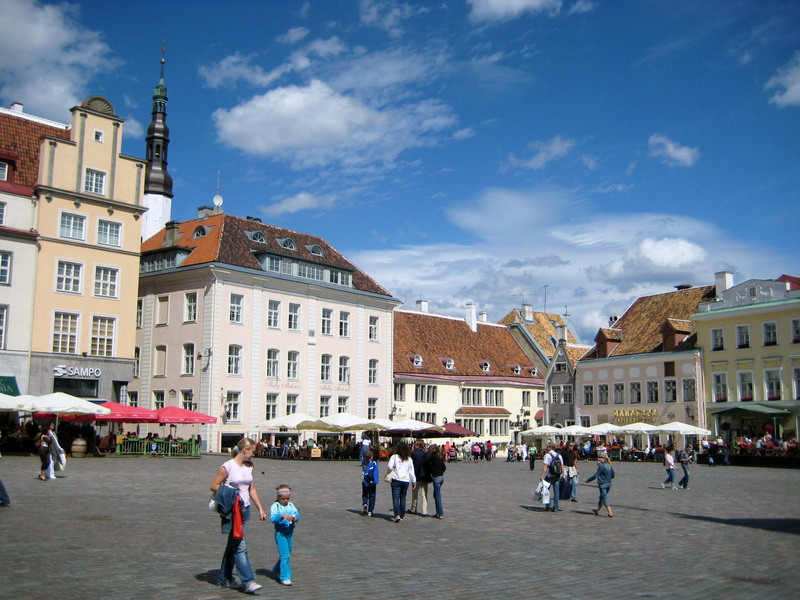 The first thing anyone does when they get to Tallinn is to walk down to the Raekoja Plats (the Town Hall Square). 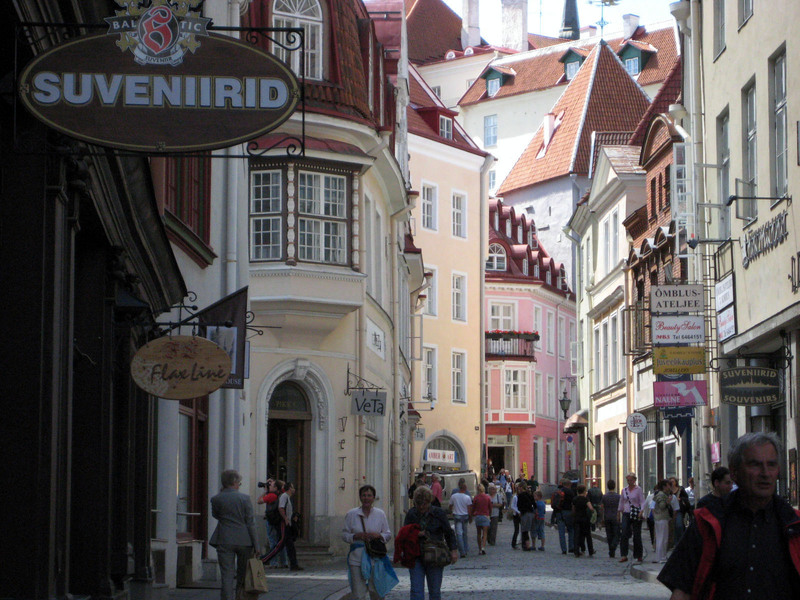 This is the heart of the old city, surrounded by cafes and buskers. The second thing you do after arriving to Tallinn is sit down at one of the cafes around the Raekoja Plats and have a Saku beer, fried herring, and fried crab fingers. Once you’re greased out with a belly full of beer, it’s time to visit the town. There are lots of museums in the Old Town. Tour guides like to point out that the Old Burchart Pharmacy was opened 70 years before Columbus discovered America. Back then it dispersed remedies made of fish eyes, lambswool and powdered rubies. It’s still a pharmacy today, but the stock has definitely changed. 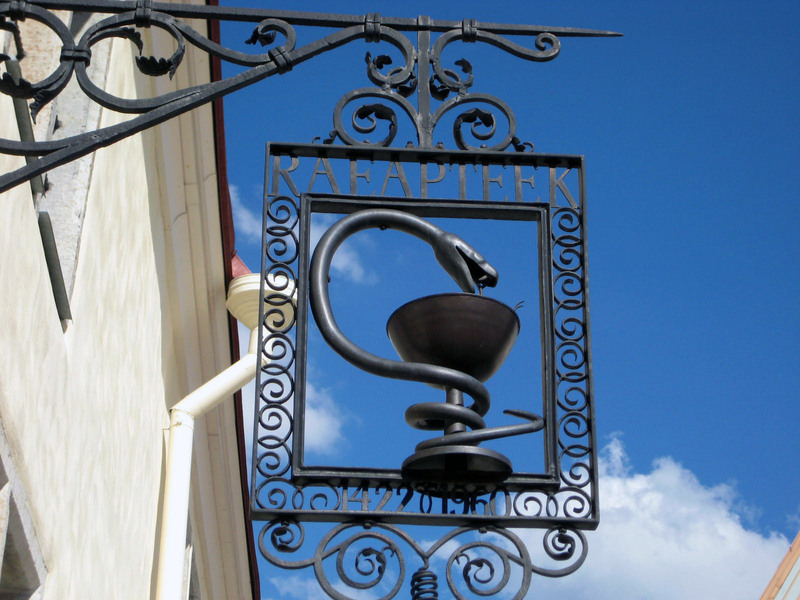 In January, 1725, Peter the Great summoned Burchart to St Petersburg, but the great pharmacist arrived too late. Peter had just died. Now it’s a quaint museum on one side and an operating pharmacy on the other, although they stopped selling fish eyes and ground up rubies a while ago. The Occupation Museum displays an interesting collection of memorabilia and film from 1939-1990 during both the German and Soviet occupations. 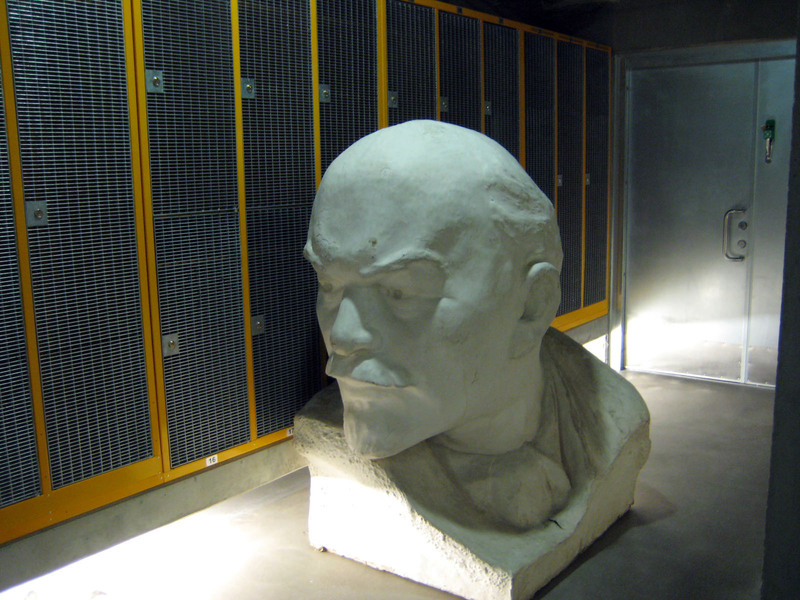 When the Estonians removed the Soviet statues after the independence, many of them ended up in the basement storage of the Occupation Museum. Every once in a while someone goes down there and dusts them off. There are a lot of old Soviets who still live here. Maybe they think the good ol days will someday return and they’ll get to bring back the Statues of Lenin to all the public squares. The old town might be mostly 17th century but the walls around it are much older. Given the fact that the city was sacked and bombed so many times, it’s amazing they’re in such good shape. Maybe because they’ve lasted this long is why the Estonians have given most of the towers endearing names. 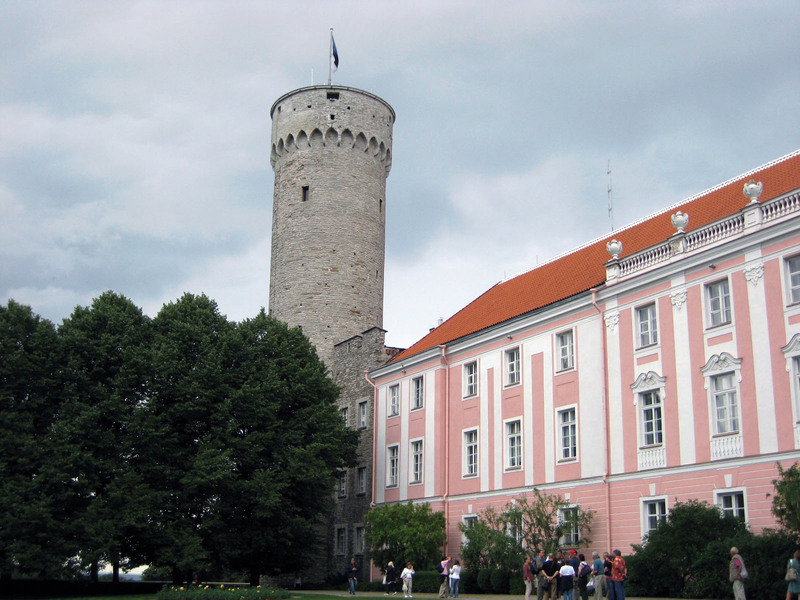 The 15th century, 165’ “Tall Hermann” tower is the flag bearer along the wall of the old fortress of the Toompea, now the Parliament building. The first Estonian flag flew here in 1884. The German flag was raised here during World War II and the Estonian Soviet Socialist Republic flag was raised here from 1944 till 1989; the Estonians didn’t use the Supreme Soviet Socialist Republic flag. They had their own. I guess there was a “favorite son” feeling from Moscow towards Estonia going back to the days when it used to be a Russian province in the 18th century. Many Estonians feel different towards the Soviets. During the Soviet “Red Terror” under Stalin, over 60,000 Estonians (5% of the population were killed. Another 10,000 were deported o Siberia. Other towers include “Fat Margaret”, “Megedi”, Virgin and Kiek in de Kök (peek into the kitchen), where soldiers used to say that from the top of the 150’ tower they could look into the kitchens of the houses below. 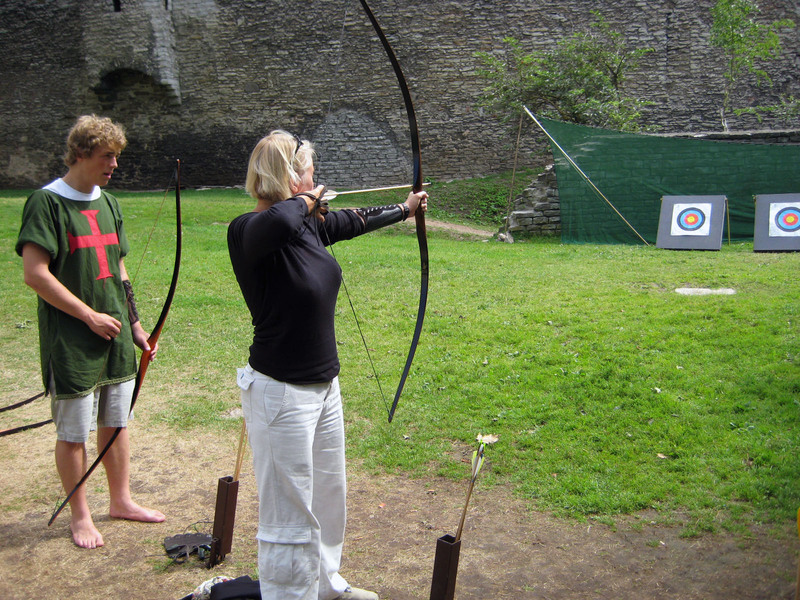 We entered an archery competition at the base of Kiek in the Kök. You pay for 5 arrows and if you get the top score, you win a bottle of alcohol (of course). Gretchen had never pulled a bow string before but got all arrows into the target. I used to be really good at slinging arrows when I was about 16, but I haven’t had a bow in my hands in over 40 years. Still, I did manage to put 2 blue, 2 red and 1 black, but no bull’s eyes and no free beer. There are enough museums with wax figure recreations of executions, Viking funerals and other medieval interests to keep one busy and out of the rain for a day or two. Or there are the old churches. Old cities tend to have lots of old churches, although they’ve been rebuilt after many fires, some of them, like the the Holy Ghost and St Nicholas churches go back to the early 1300’s. 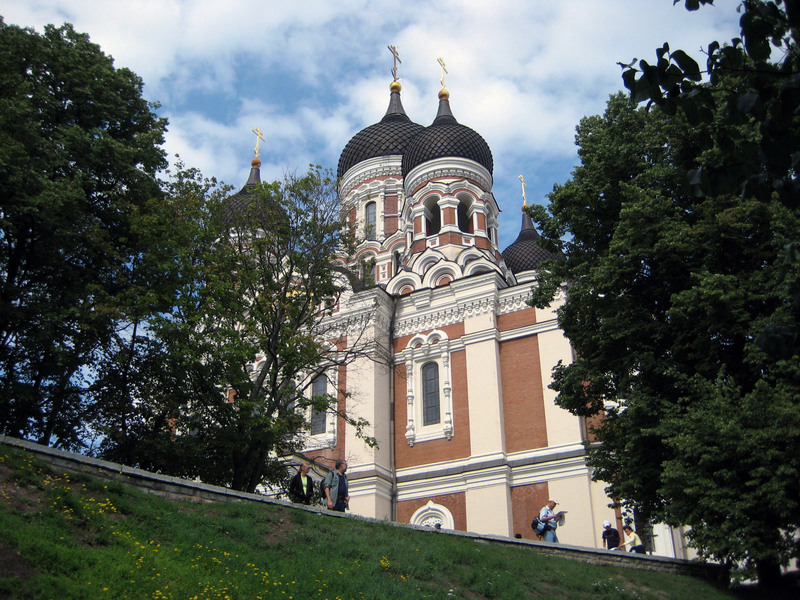 The Dome Church on the Toompea Hill was consecrated by Valdemar (the Christian Viking) in 1240. And for the Russian population, there is Alexander Nevsky Russian Orthodox Church built in 1900. When we visited Nevsky church, there was a funeral in progress. Tourists were walking by the dead body as if they were visiting Lenin’s Tomb. It was weird. An Italian tourist outside the Church informed us that it is very bad luck if uninvited guest show up at a funeral and look into the face of a dead person. The evil spirits hiding in the corpse are looking for a living entity to jump into and they will go for an unknown rather than a member of the family. After the Independence, 50% of the Russian population stayed here; and why not. 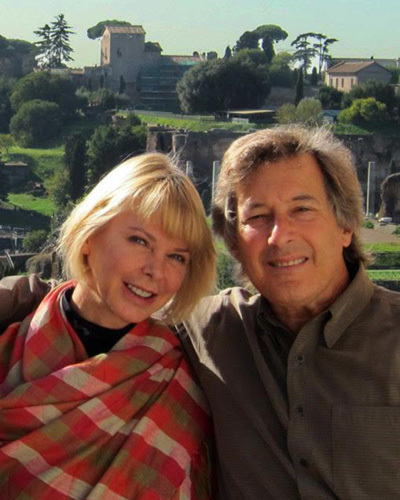 This a beautiful place and they’d lived here for most of their lives. The Estonians and the Russians endure each other, although there are a few flare-ups now and then. In April 2007, when the Estonians moved a Bronze statue of Soviet soldier (commemorating the lives lost by the Soviet heros during the German occupation) from the center of town to a more remote location, the Tallinnian Russians went crazy. In the riots that followed, the shops of the Old Town were looted and smashed. Three months later, when we arrived, we still saw the remains of the broken windows. 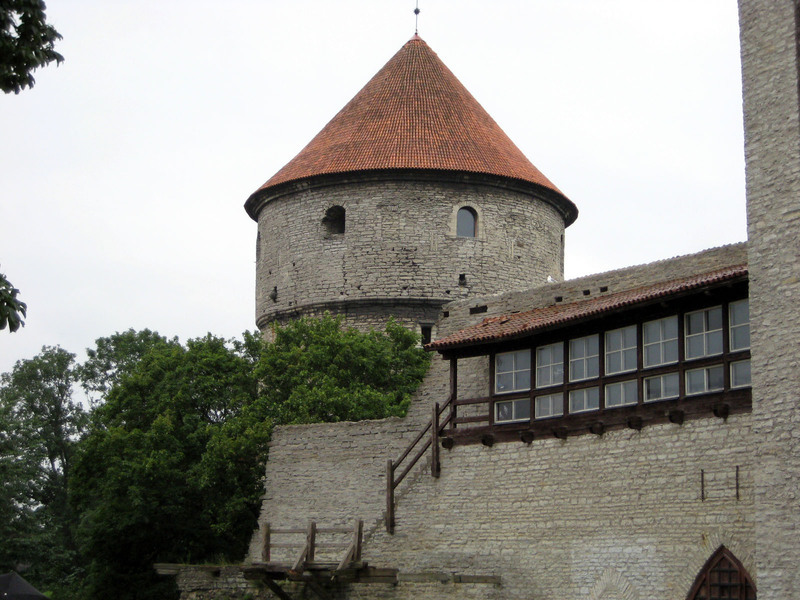 Tallinn is a lot more than just the Old Town. There is a vibrant new city. We did venture out one evening to catch a film in the enormous Coca Cola Cinema Complex. You don’t just buy a ticket to the film, you buy a seat. You’re shown a seating chart as you purchase the tickets. This is a pretty popular concept in many European theaters. The film (Harry Potter and the Order of the Phoenix) was almost sold out and our seats were towards the front and to the side, but the theatre was cavernous and the screen set far enough away from the front row of seating that there were no bad seats. Even the first row had good viewing without folding your neck behind you. As the film ended, I got up to leave, thinking Gretchen was right behind me, but when I looked around she was no-where in sight. I tried to spot her but once I realized that every other women in Estonia looks just like her, blonde hair, blue eyes, around 5’7″ tall. I moved aside and waited for her to find me. Not many Estonian men look like me. On our last night we managed to get a table at Vanaema Juures (Grandma’s Place) on Rataskaevu Street near the Town Hall square. It’s one of the most famous of the Estonian cookeries in the old town and really hard to get a table. We lucked out. This is good old home cooking, Grandma style, from the sweet black bread and marinated herring salad to pepper crusted beef filet cooked in apple plum sauce and braised lamb with gorgonazola sauce. The cavelike basement dining room is a bit stuffy and the décor is bizarre. The old 1940’s TV on a ledge above played 1940’s polkas while a clock nearby chimed every 15 minutes. In the music club above the restaurant, bands were rehearsing for the evening’s rock and roll extravaganza called “The Revolution Will Not Be Televised.” It was at full volume and every once in a while the plates would shake on the tables below. But none of the distractions really annoyed us. The food was that good. We played it safe and ordered familiar looking choices, staying away from dishes like tongue known as “gossip’s fate”, or boiled pork in jelly made of bones, hooves and heads or sauerkraut stew with pork and taters. We also heard that bear eating was big in these parts but not at Grandma’s place. We saw no bear on the menu; but then again, they did just give us the English version of the menu.